The heat wave continues and it's still very warm and humid. The temperature is fine, it's the closeness of the air that is uncomfortable. 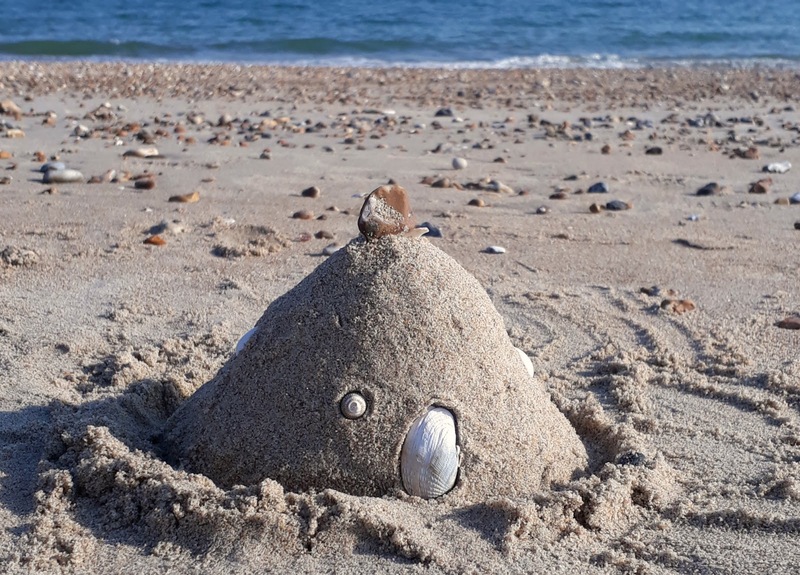 So, after three very sweaty days at work, and with a forecast of rain and cooler air on the way, we decided not to bother taking the kids to their scheduled weekly swimming lessons tonight and went down to the beach instead. John and I swam and, for the first time, Angus joined us. Although Bella and Angus swim very well in a pool, they have both always been nervous of sea swimming; it is always too cold, the waves too big, the sea too unending. But today Angus had to be dragged out of the sea and he had such a great time, it was a joy to watch him. Bella, always the risk averse one, watched from the shore. Maybe next year. We lay on the sand for a while then went to get fish and chips for tea. It was still so light when we left the beach at around eight, but the sun was just starting to drop down. Our annual heat wave evening swim, it was lovely. I see that I wrote very similar posts last year and the year before, with similar photos. I hope I can write another this time next year - perhaps Bella will swim in the sea with us then. Good to see you keeping up such a nice tradition. Lovely photos of your beach time, as always. Though a good swimmer our daughter never liked swimming in natural bodies of water, still doesn't and she's grown. Wonderful, and I can think of few better ways to spend the longest evening of the year! I do not like swimming in the sea all that much, either; mainly because I can not see well without my specs and feel unsafe for that. I was brought up by the sea in Cumbria. St Bees was the best local beach and I so miss it in summer. Your post brought back great family days and nights at the beach. Memories to treasure for ever. What a treat for you all. 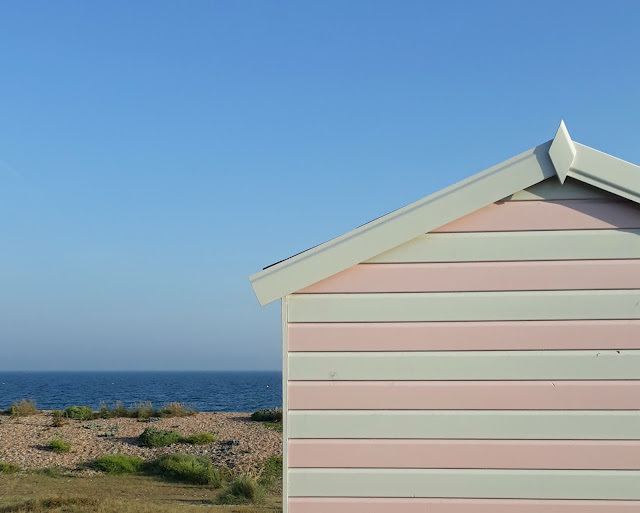 Love those pretty beach huts, especially the pink/white striped one. Your fish & chips look yummy. We may take a walk along the beach tomorrow morning as we are away at the moment & are staying in a beachside caravan park. Will try & get some photos & post when we get home. Take care. Olly loathed swimming lessons and pool swimming. But loves the sea and swimming, surfing and the like. Good for Angus. Maybe Bella will next time. The weather broke here today. The cooler air was a relief. What a perfectly lovely evening! Thank you for taking the time to share! 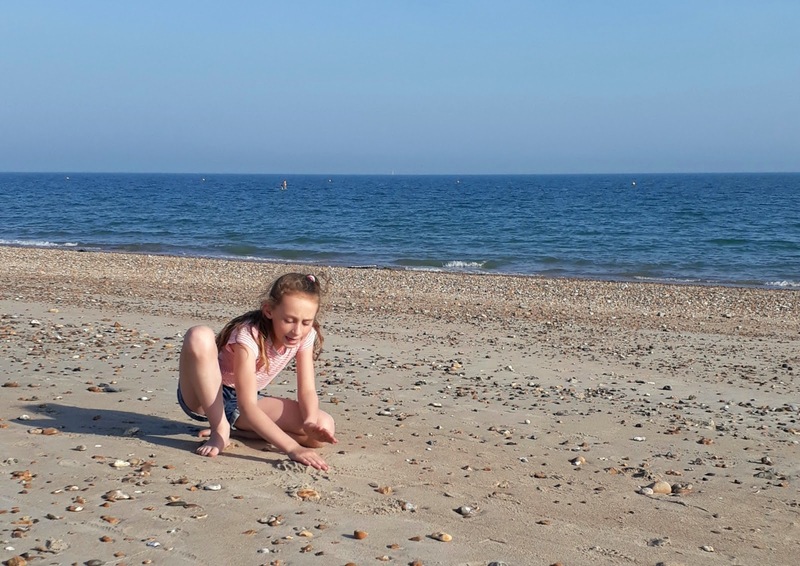 I love that Bella is grown up enough to have shoes that match her mother's ....yet young enough to build the sand castles and collect shore treasures! Best you enjoyed the heat while it lasted! What perfection and absolutely the only thing to do in this weather! Lovely photos of a lovely outing! What a perfect way to spent the solstice evening :) I was at school until 8pm sadly, and it wasn't so sunny up here, but I drank silver birch wine in the garden when I got home! What beautiful pictures! We live on the Oregon coast in the U.S. Our temperatures have been too cool for even short-sleeve shirts and our ocean temperature is around 50 degrees F. We have a heat wave coming though. It's nice to see coastlines in other parts of the world. i /still/ miss the sea, after 20 odd years Leeds is still too far from the beach!